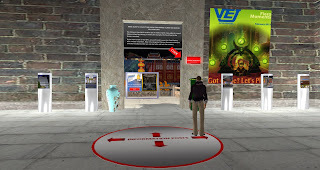 For this activity you will be visiting Chinese Island, part of the virtual campus of Monash University in Melbourne Australia. Kaylee West is the avatar name of the Chinese language professor at Monash University who manages Chinese Island. Your Chinese language professor will provide you with detailed instructions on what you are to do at the Chinese Island. 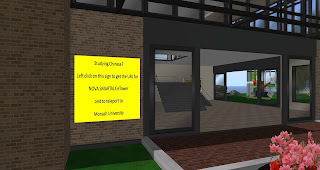 This document assumes you are at the main landing site on the NOVA campus (see image below). 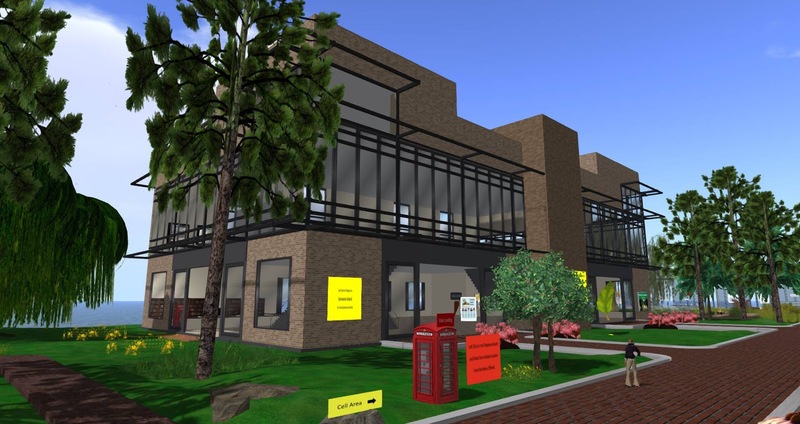 If you are not at this location, please use the handout “Getting Started on NOVA’s Campus in Second Life” to get to the right location. At the landing site you will see a large building on one side of the sidewalk and a lake on the other side. There are two doors coming out of this building to the sidewalk. The door nearest you is the one on your left (facing the building). The door further down the sidewalk is the door on your right (facing the building). Go to the door on the right and you will see a large yellow sign to the left of this door (see image below). The sign will say “Studying Chinese?” at the top. When you left click on this sign you get two things 1) the webpage for the NOVA SMARTALK e-Tower and 2) a map for Chinese Island at Monash University. 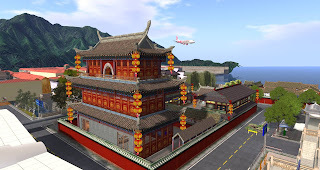 At the bottom of that map is the work “Teleport.” Left clicking on Teleport will take your avatar to the landing site at Chinese Island (see image below). When you arrive at the landing site on Chinese Island you will be offered a notecard about the area. Please accept this notecard and read it. On the walls at the landing site are many posters and a map of the area. Feel free to look these over and get a Monash University T-shirt. Walk out the large door at the landing site and you will see a small Chinese town (see image below). The town has a mixture of old and modern Chinese style buildings. There are many interactive activities here to help you develop your Chinese language skills. You can practice such things as ordering food in a restaurant, buying food in a grocery, renting an apartment, taking a train, riding a bus, etc. Some of these activities require that you use a HUD (Heads Up Display). Your professor should have provided you with a handout giving detailed instructions on activities to do, how to load the HUD, and how to complete the activity. Feel free to walk around and explore the Chinese town. To exit Second Life, left click on the white X in the red box, top right of your screen. When you return, your avatar should be in the location you were when you exited.